Having quality disc golf courses can benefit your community. Clubs and leagues will form and create bonds of unity and friendship. Groups of all types can get together to enhance the quality of their lives by socializing and playing. In addition to providing a venue for recreational outlet that everyone can participate in, disc golf helps stimulate a positive economic impact. Disc golfers love to travel to play different courses. These enthusiasts are likely spend money at local businesses, dine at local restaurants, and stay in local hotels. Disc golf courses are especially likely to positively impact a community when they host regular tournaments. According to the National Recreation and Parks Association, the purposes of public parks are to provide economic value, health, environmental, and social benefits to a community. The reality is that in many cases taxpayers pay for public lands that are rarely used. Adding a disc golf course will bring users to park areas that may be primarily unused. Disc golf courses can also serve as a safety measure by providing traffic in areas that may otherwise be subjected to graffiti, underage drinking, or drug use. Unlawful activities are less likely to happen when people are around that may witness or report suspicious activity. Disc golf is played year round and during all hours of the day. In the past decade the number of disc golf courses in the United States have more than doubled. Countless community parks have added disc golf courses in recent years. One example is in Cache County, Utah. From 2011 to 2016, one 9-hole course, installed on land owned by the city of Providence, was joined by two more 9-hole courses in Hyrum City and Nibley City, as well as a competitive 18-hole course on the Cache County Fairgrounds property. Also, another 6-hole course in Amalga City (a town with a population well under 1,000 residents) and 7 holes were set up at a local high school in the city of Smithfield. That is significant interest and growth for the sport in only five years, in a small rural county with a moderate population. State Parks often have ample underutilized land that has potential to make great disc golf courses. According to the website, Farragut, Lake Walcott, and Massacre Rocks state parks sell disc golf accessories in their gift shops and provide course maps and score cards. The parks host regular tournaments and welcome leagues and casual players who pay park fees, camp, and enter the parks just like any other visitor would. Many golf courses throughout the country are struggling financially. Adding disc golf is one way to add additional revenue with almost no additional maintenance costs. 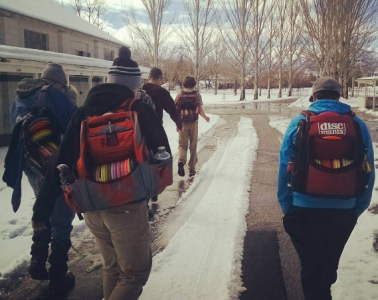 In Northern Utah, the privately owned golf courses Mulligan’s at Creekside generates more revenue from disc golf than it does from traditional gold during the winter months. The Emporia Country Club in Emporia, Kansas revenues more than $70,000 annually from disc golfers. Many ski resorts have installed disc golf courses as a way to get more visitors during the off season summer months. Ski resorts can generate money by selling disc golf equipment and charging for lift passes. Some of the top rated disc golf courses in the world are located at Ski Resorts. There are a few communities in the USA that are increasingly built around the sport of disc golf. 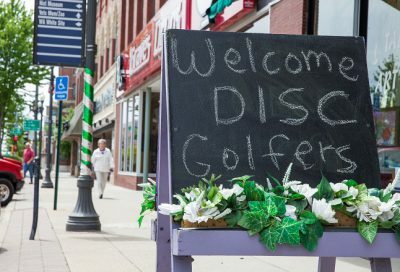 So much of their citizens are disc golf enthusiasts that businesses are built around the sport, tournaments are drawn to the area, and their communities become destinations. Take a look at the city of Emporia, Kansas as an example of one such community. With a population of about 25,000 people, the city is home to Dynamic Discs, one of the major disc golf distributors in the United States. Emporia hosts major disc golf tournaments like the annual Glass Blown Open (GBO) and the Professional Disc Golf World Championships that attract thousands of participants and visitors. The city has even closed Main Street during those events for vending and tournament related festivities. Not only are its citizens employed directly by disc golf through related businesses, but the entire community benefits from increased tourism, sold-out hotels, bustling restaurant and eateries, and an increased sense of community. There is no doubt that cities like Emporia have enjoyed a boon with the building of a disc golf community. Since the sport took shape in our community, it has seen steady growth by the number of players, events, and the increase in sales of disc golf equipment. This growth affects sales tax as well as transient guest tax for our city. The popularity of the sport has spread not only in our community but world-wide. Because of the significant disc golf events held in Emporia, visitors come not only to compete but often come back at other times to play our courses, many of whom are from out of state. Overall, the popularity of the sport has created a “buzz” in our community that has brought a spirit of pride to Emporia and has achieved recognition around Kansas, the United States, and in many foreign countries. Suffice it to say, the sport of disc golf has contributed to the success and livelihood of the Emporia community. Major disc golf tournaments attract players from all over the world which has a significant financial impact on the community. 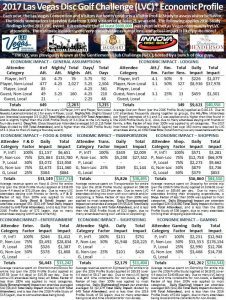 It’s estimated that the 2017 Las Vegas challenge had an economic impact of more than half a million dollars.